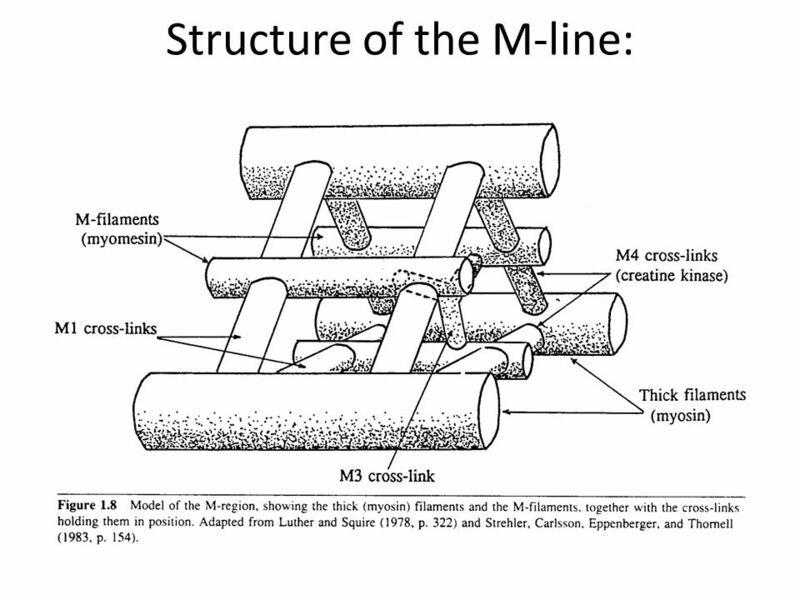 14 5. 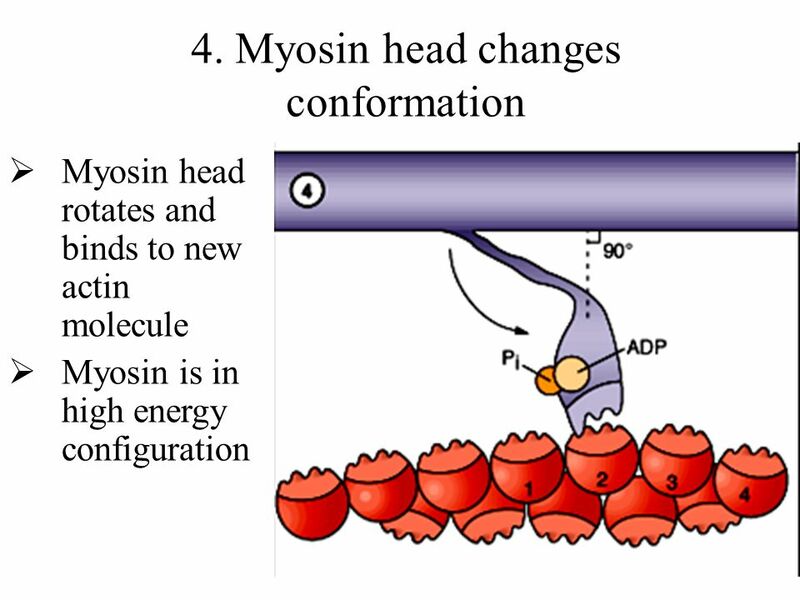 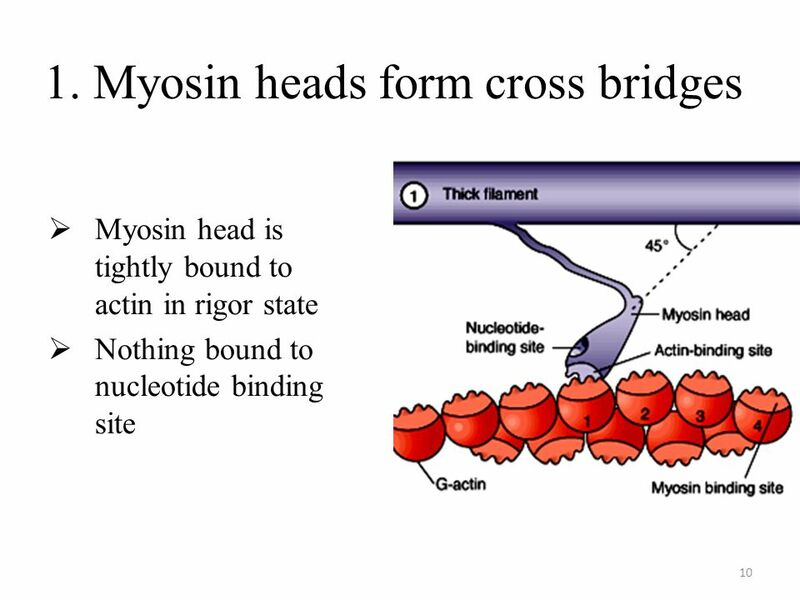 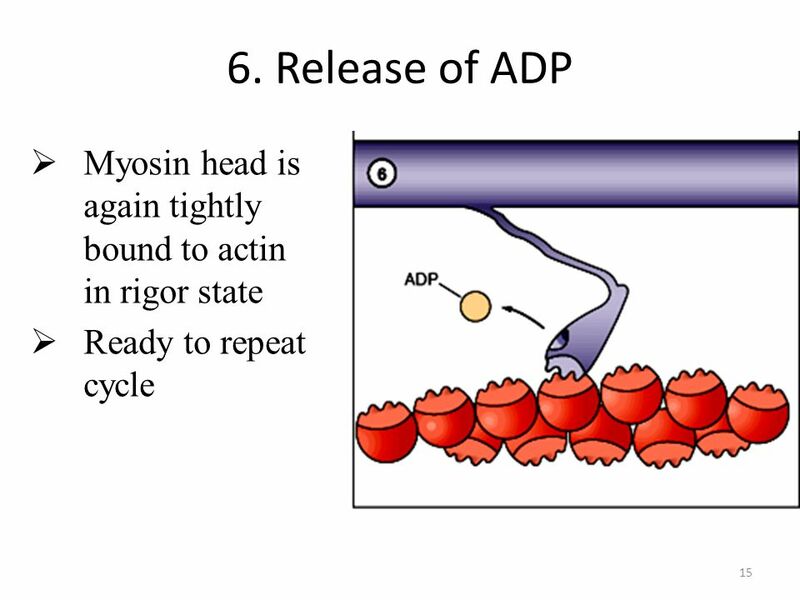 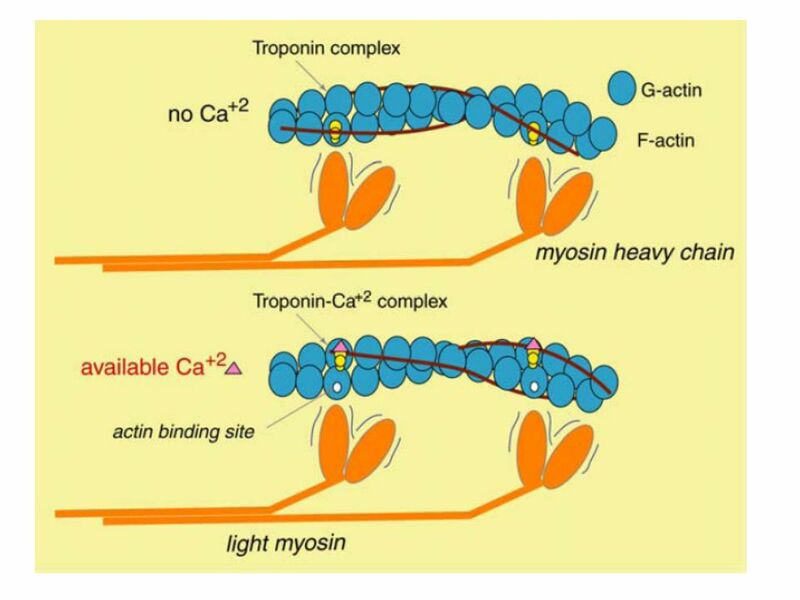 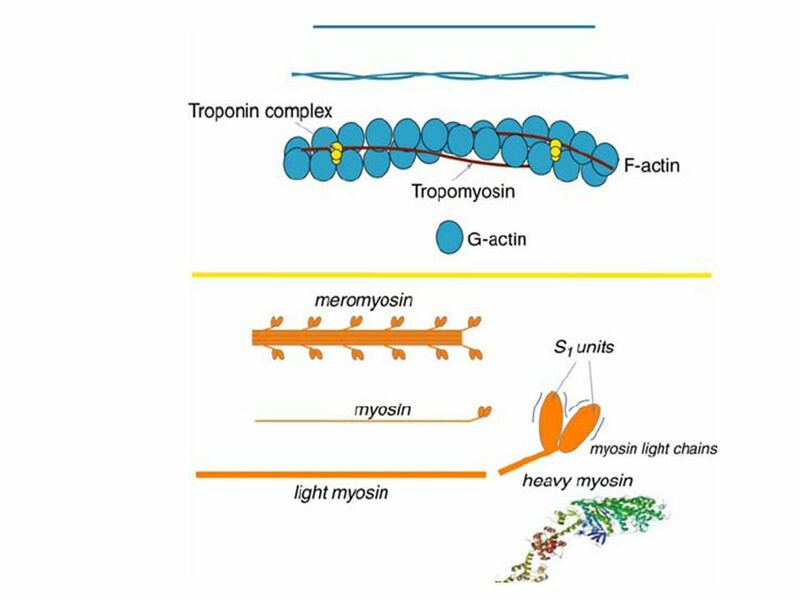 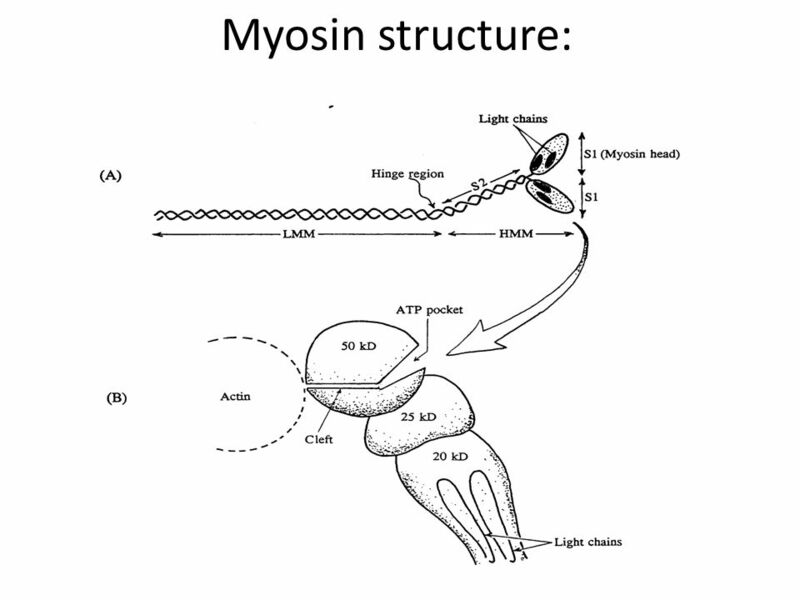 Power stroke Release of Pi from myosin releases head from high energy state Head pushes on actin filament and causes sliding Myosin head splits ATP and bends toward H zone. 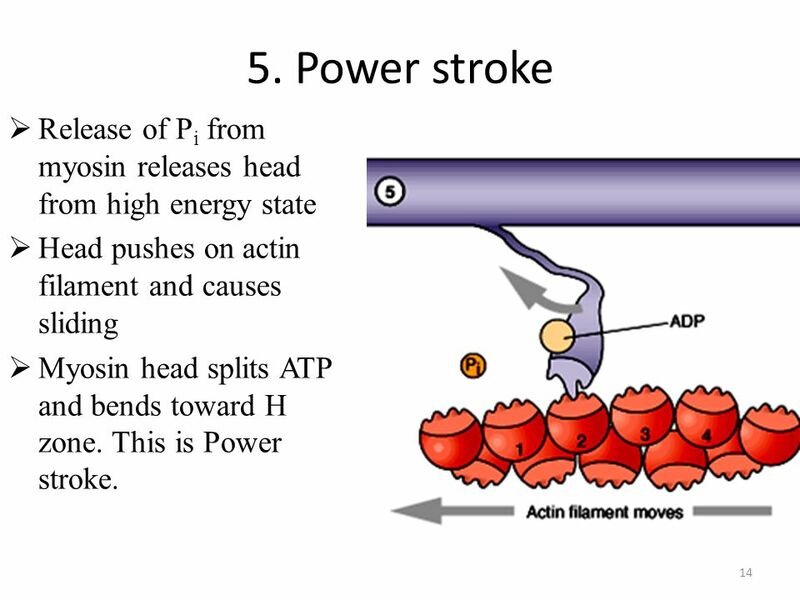 This is Power stroke. 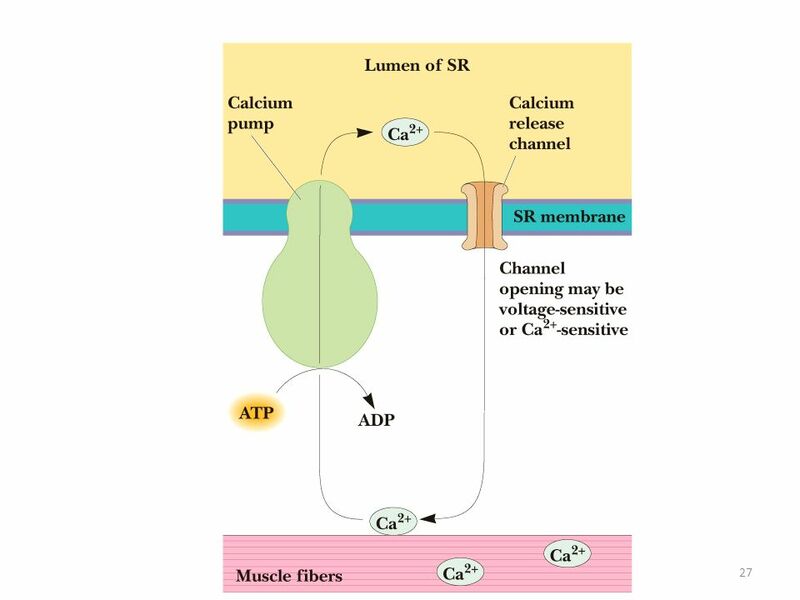 19 Need steady supply of ATP! 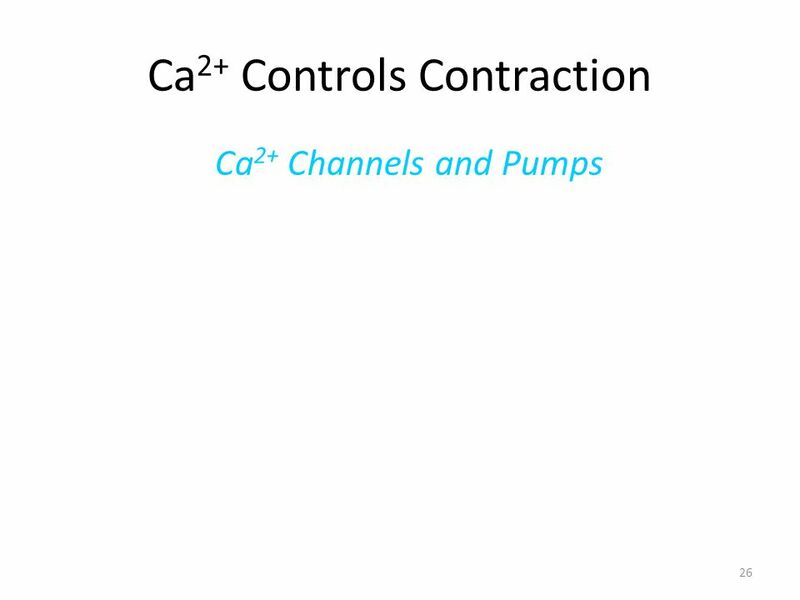 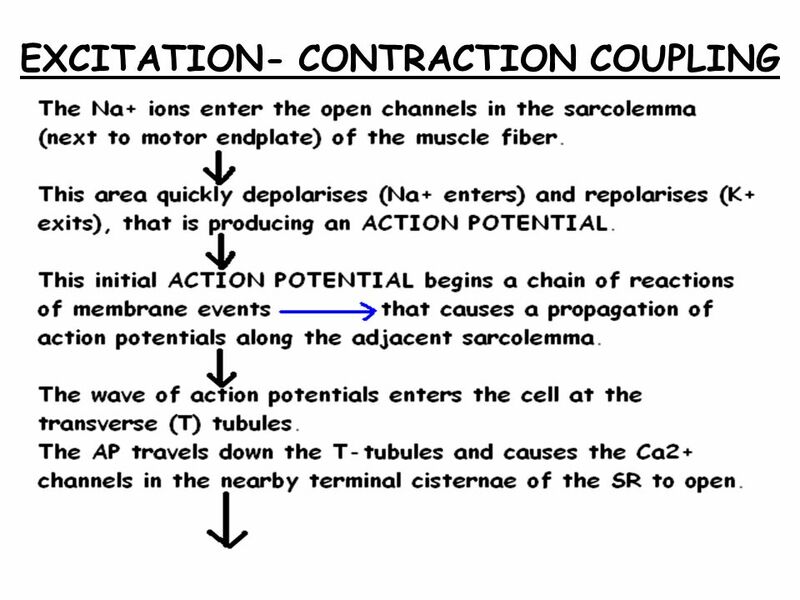 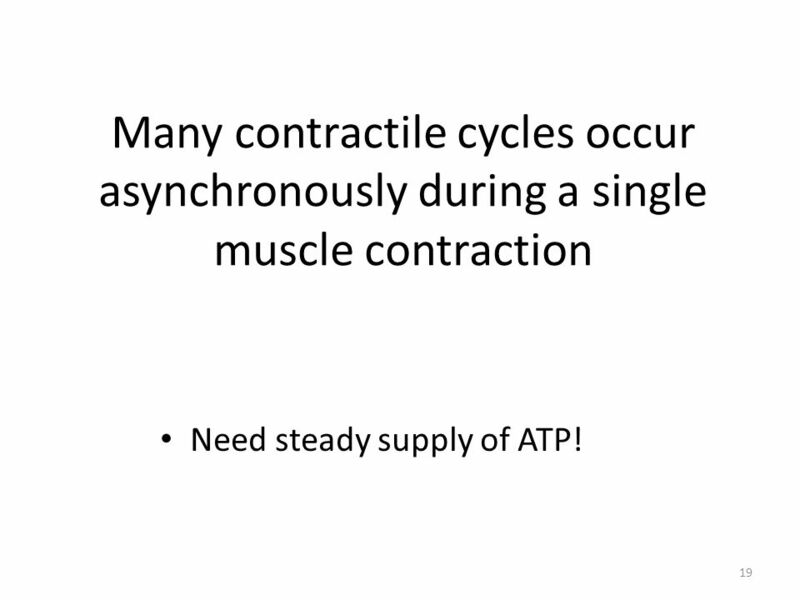 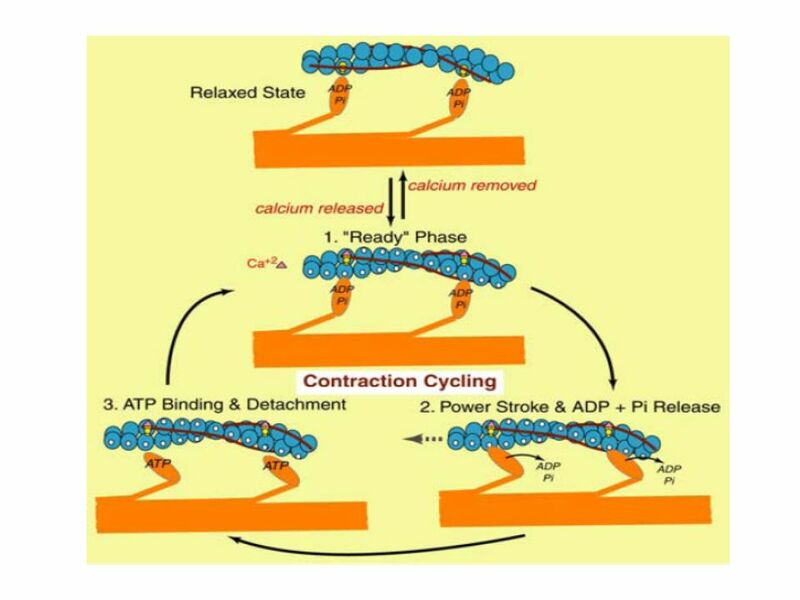 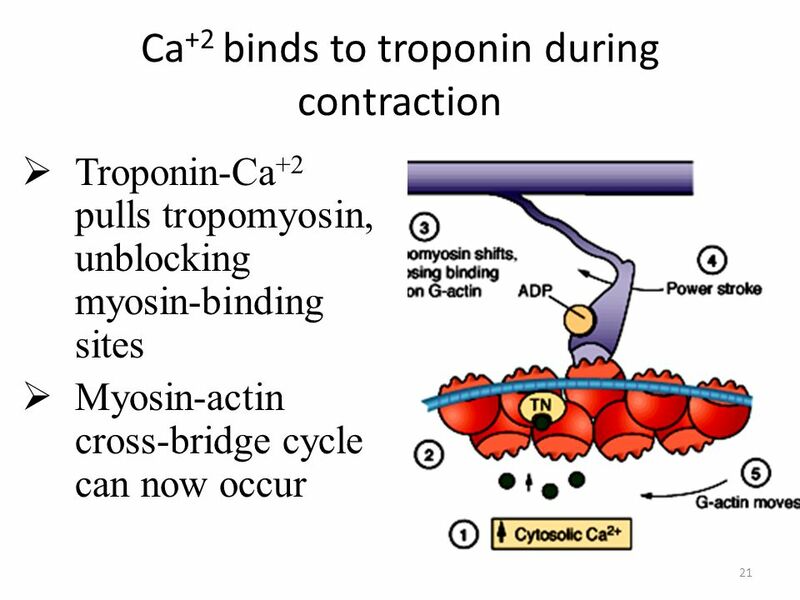 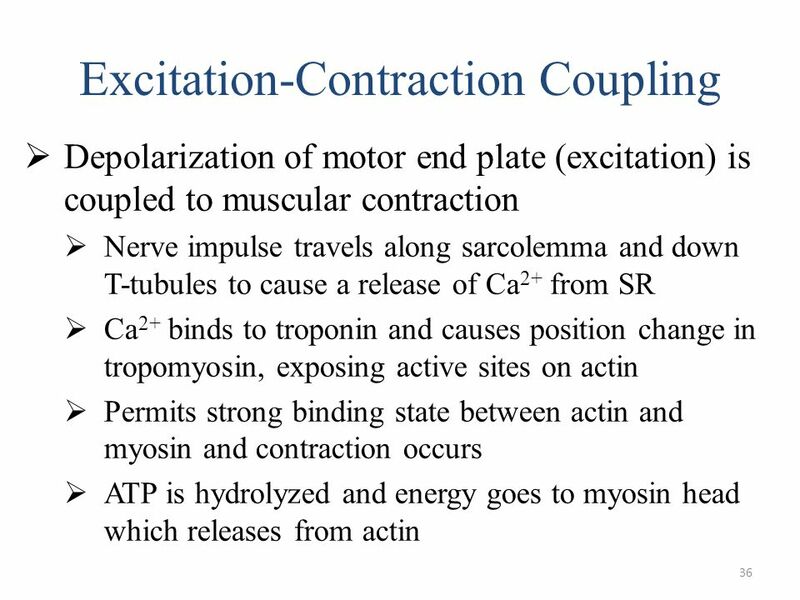 Many contractile cycles occur asynchronously during a single muscle contraction Need steady supply of ATP! 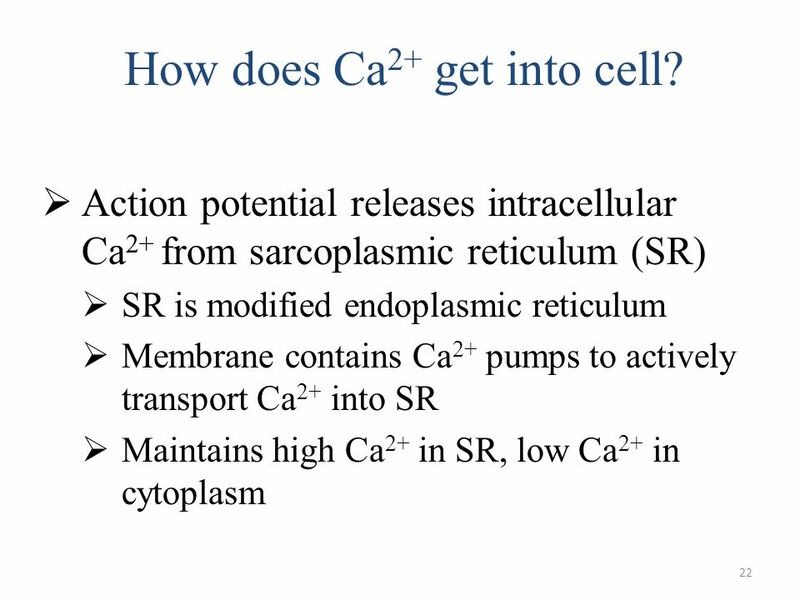 22 How does Ca2+ get into cell? 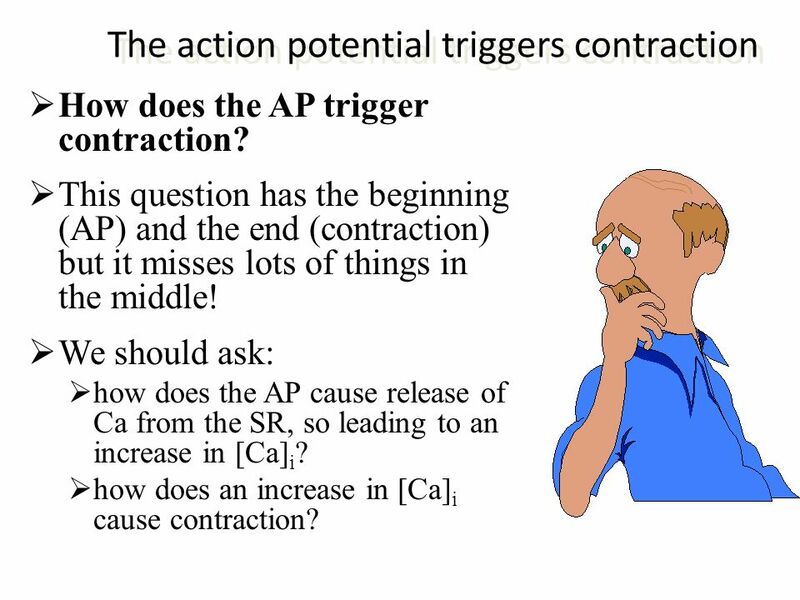 How does the AP trigger contraction? 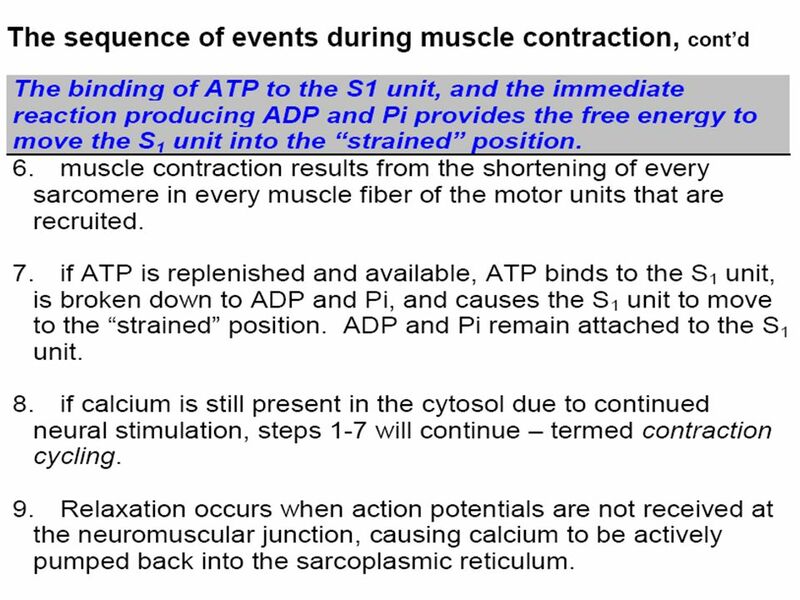 This question has the beginning (AP) and the end (contraction) but it misses lots of things in the middle! 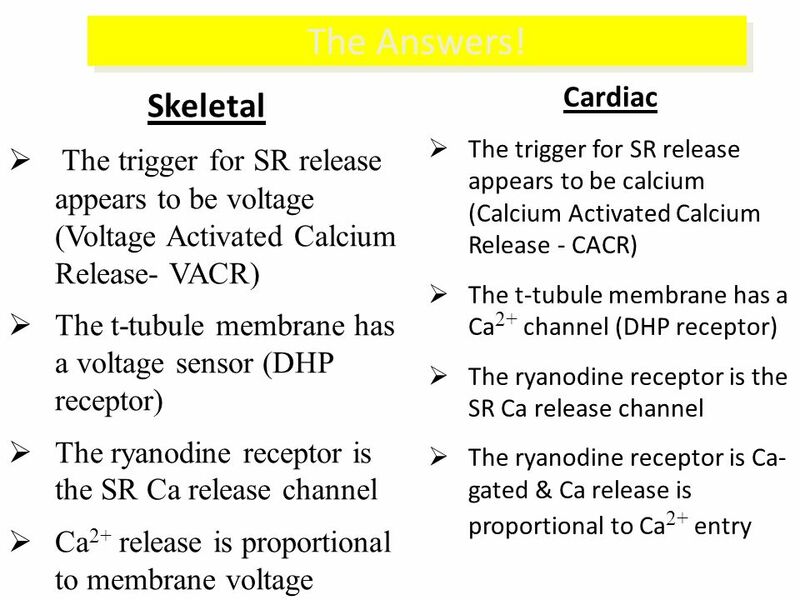 We should ask: how does the AP cause release of Ca from the SR, so leading to an increase in [Ca]i? 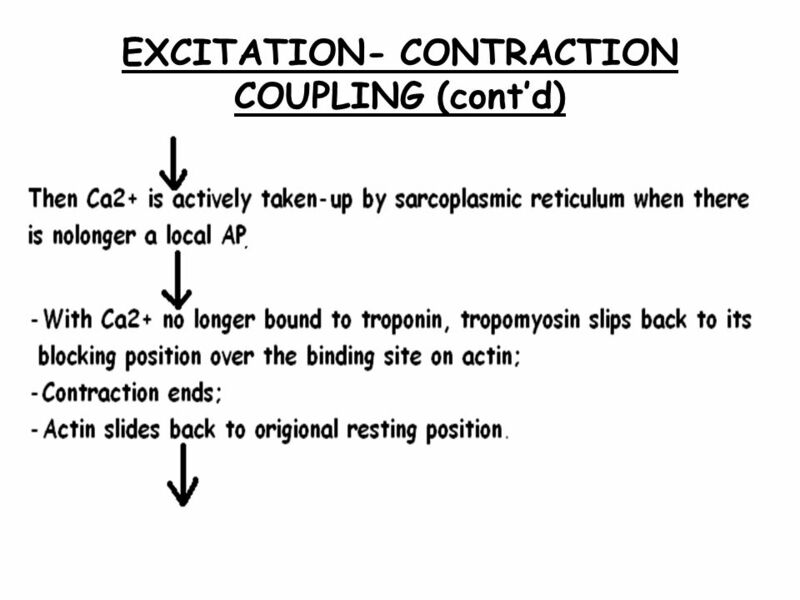 how does an increase in [Ca]i cause contraction? 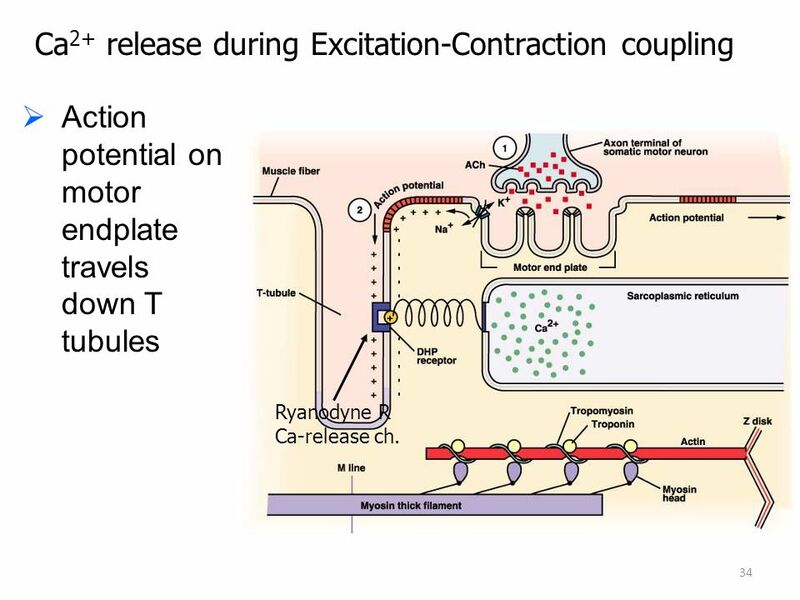 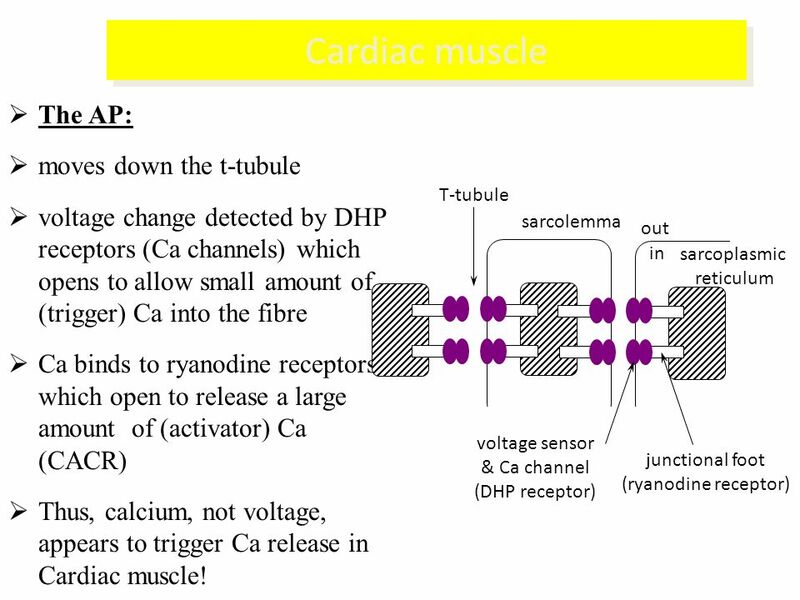 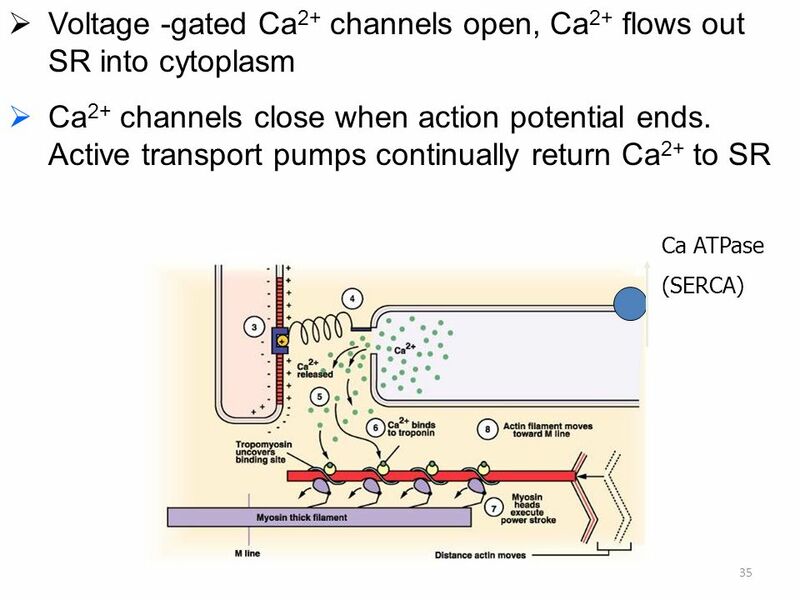 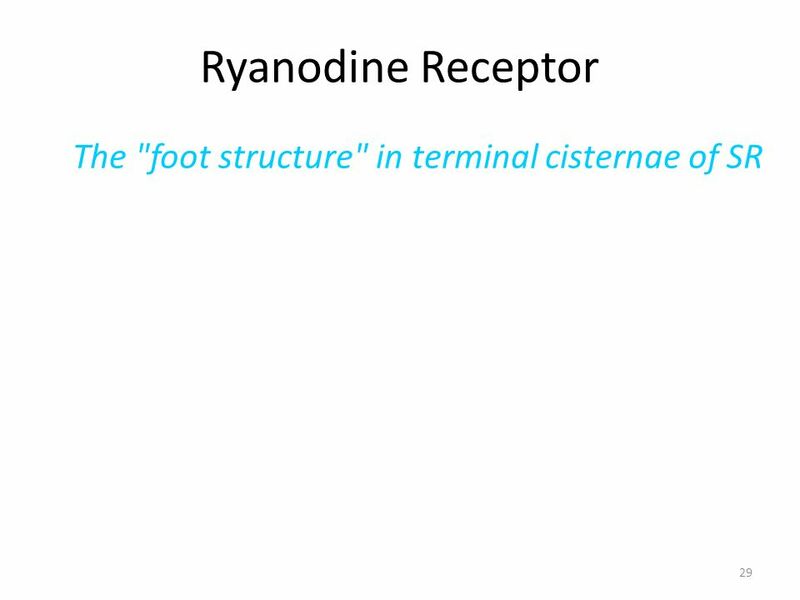 Action potential on motor endplate travels down T tubules Ryanodyne R Ca-release ch. 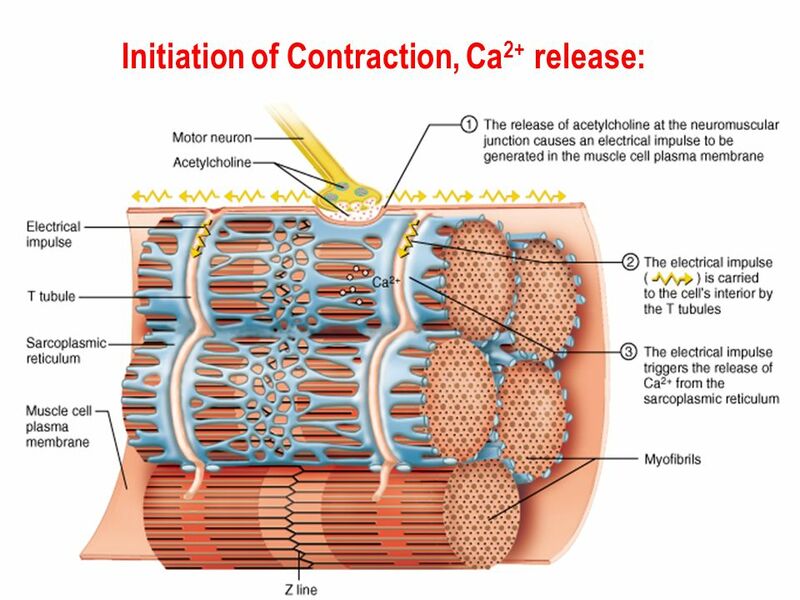 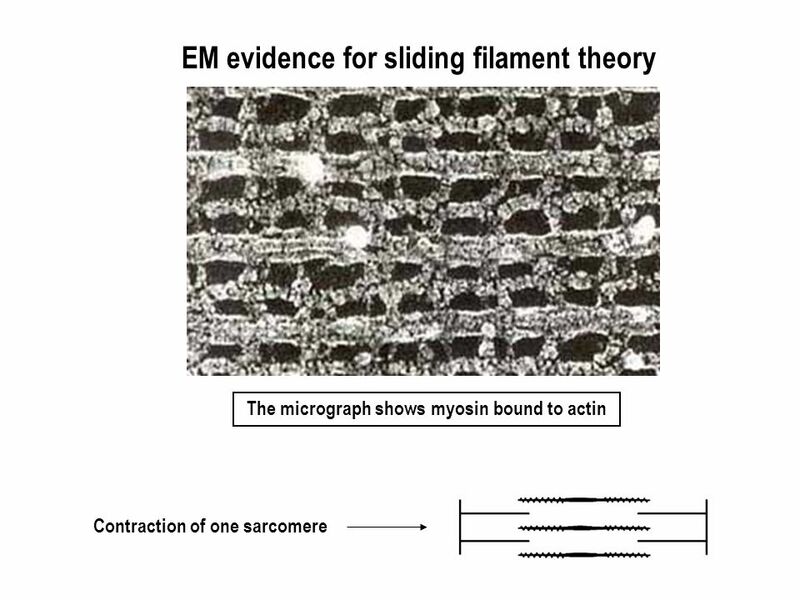 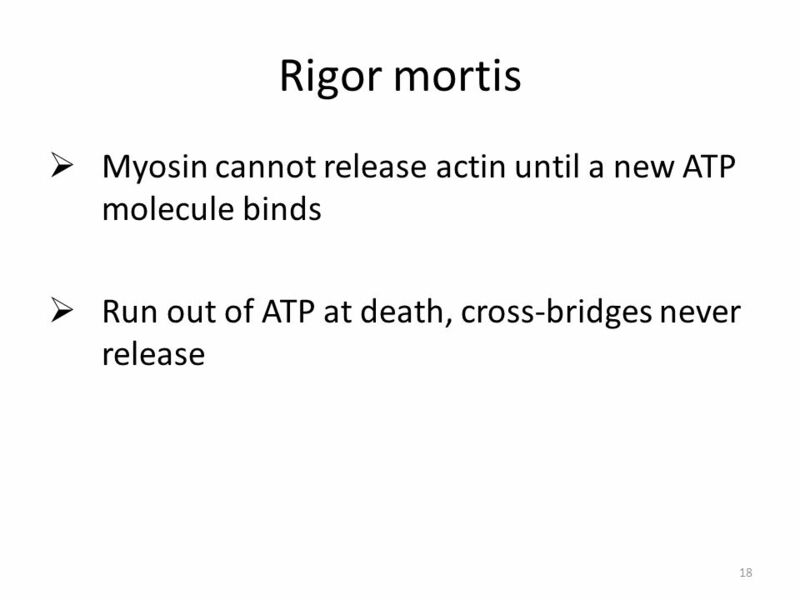 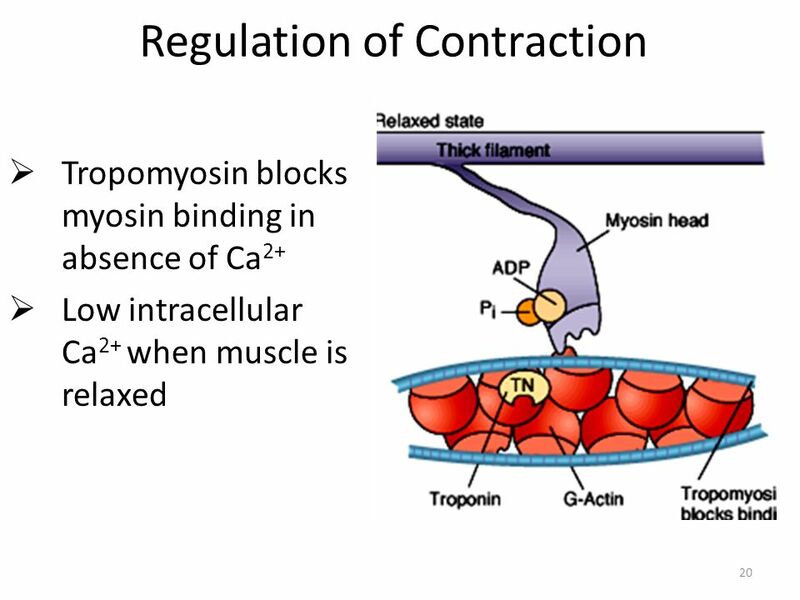 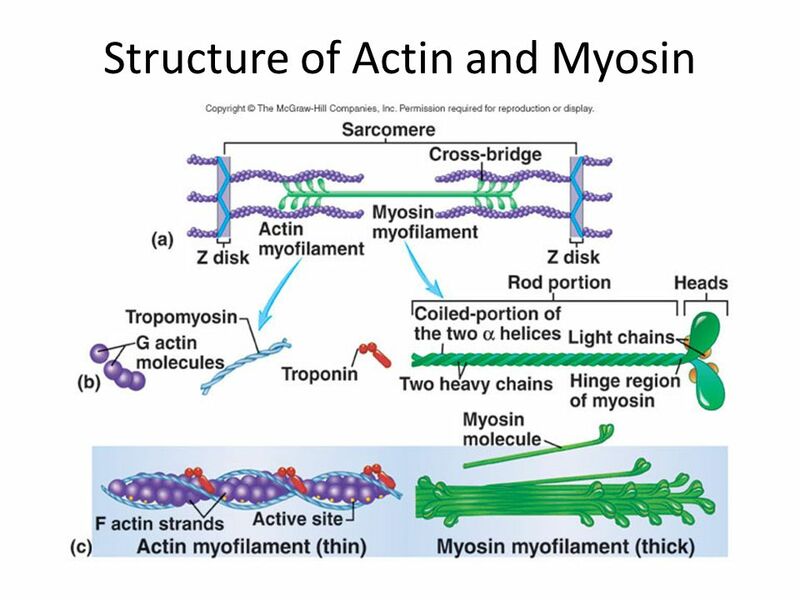 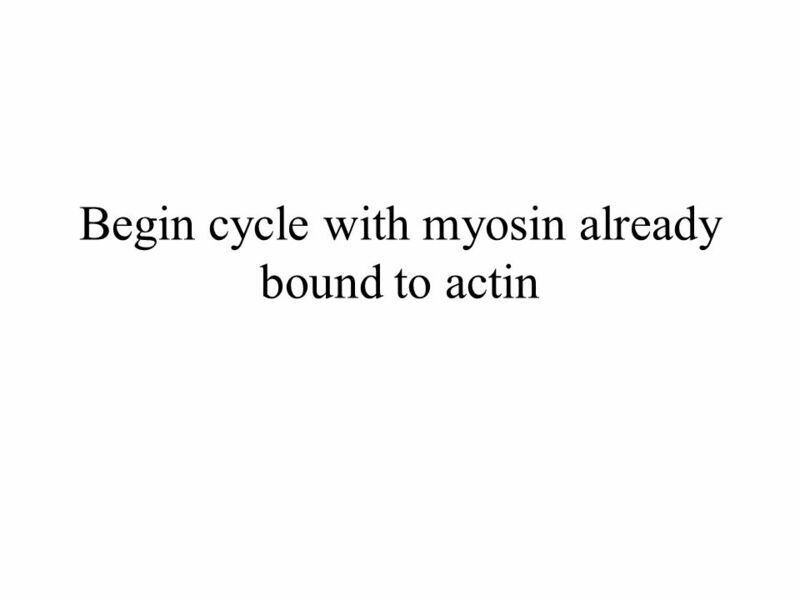 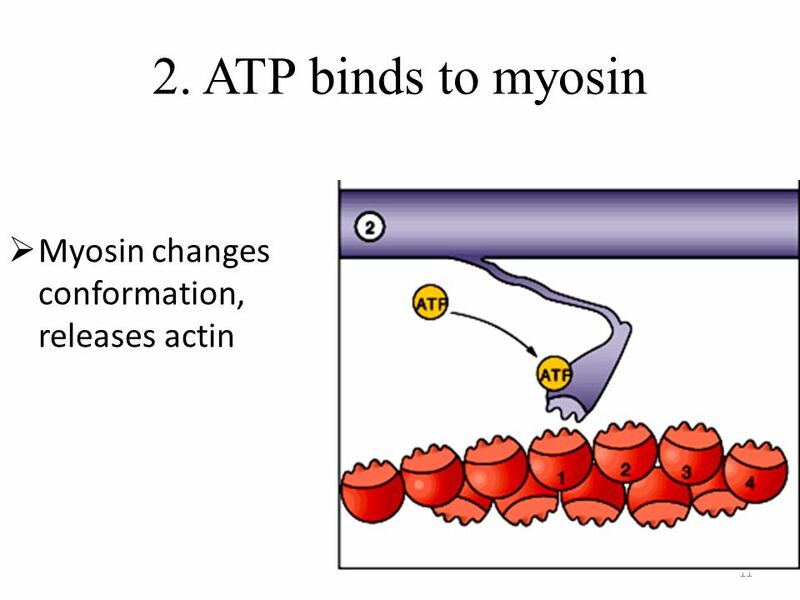 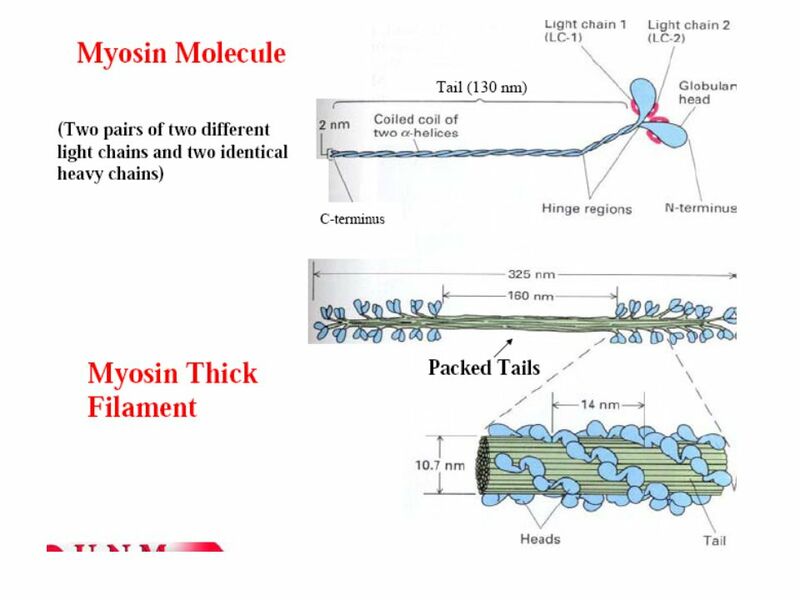 Muscle contraction occurs when actin and myosin, the major proteins of the thin and thick filaments, respectively, slide past each other in an ATP-driven enzymatic reaction. 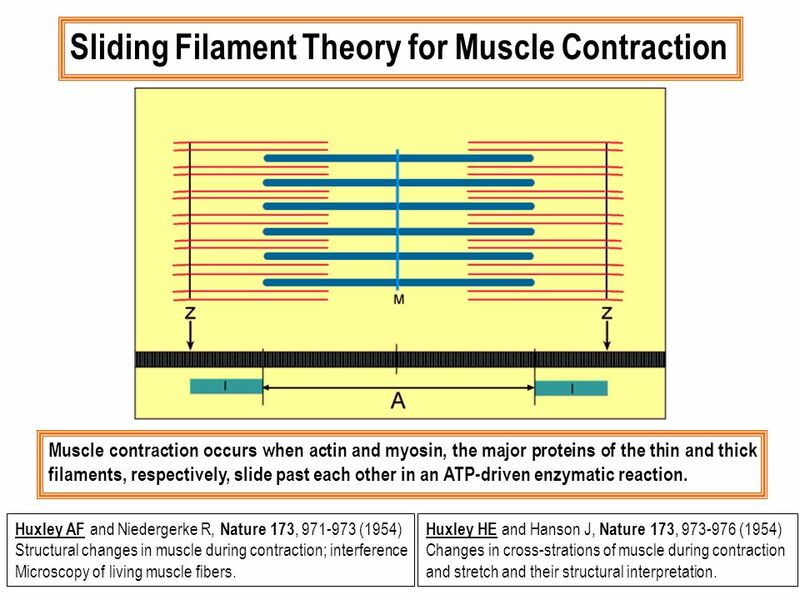 Huxley AF and Niedergerke R, Nature 173, (1954) Structural changes in muscle during contraction; interference Microscopy of living muscle fibers. 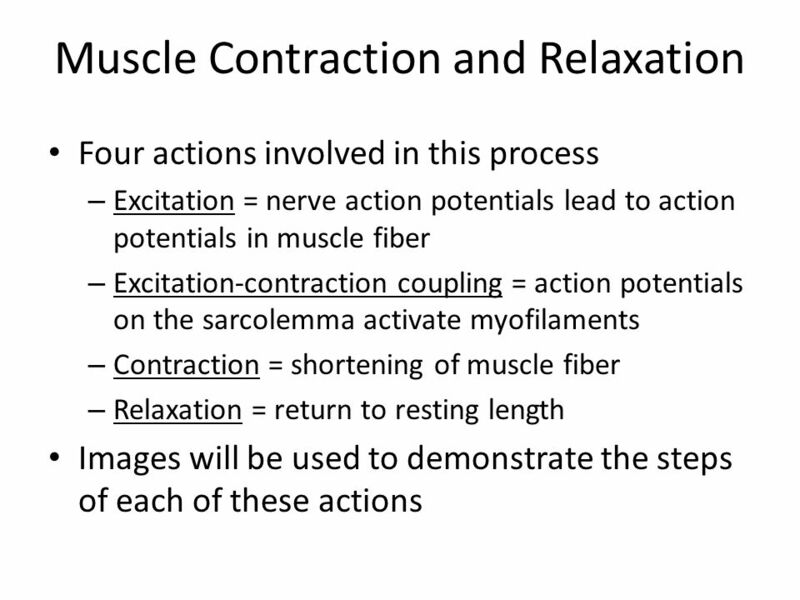 Huxley HE and Hanson J, Nature 173, (1954) Changes in cross-strations of muscle during contraction and stretch and their structural interpretation. 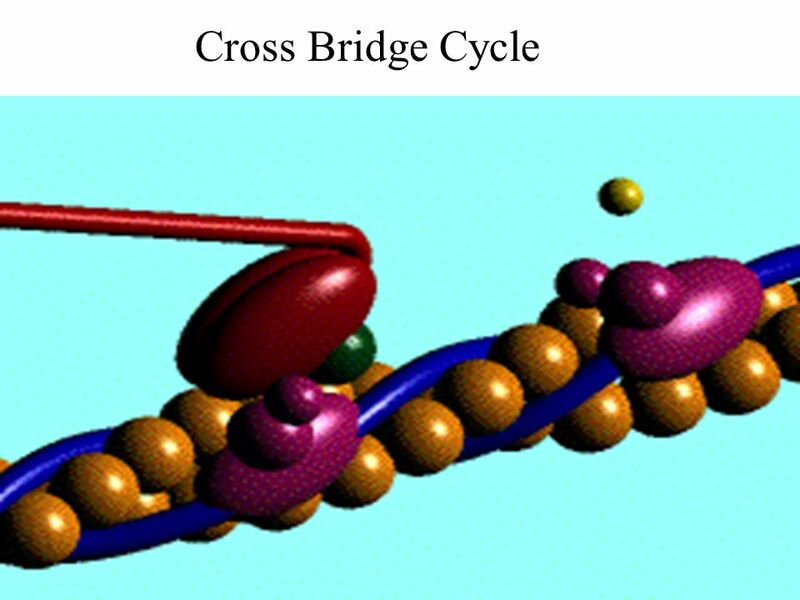 Coupling of chemical reactions with vectorial motion. 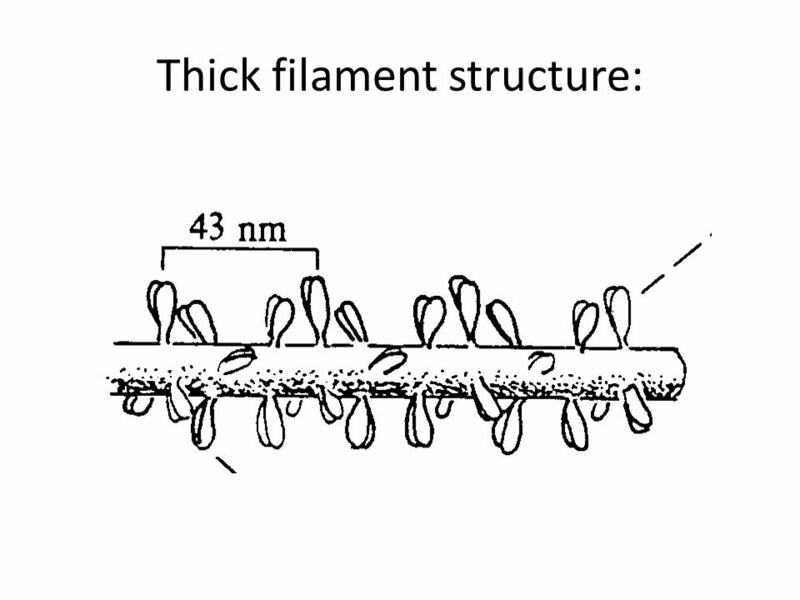 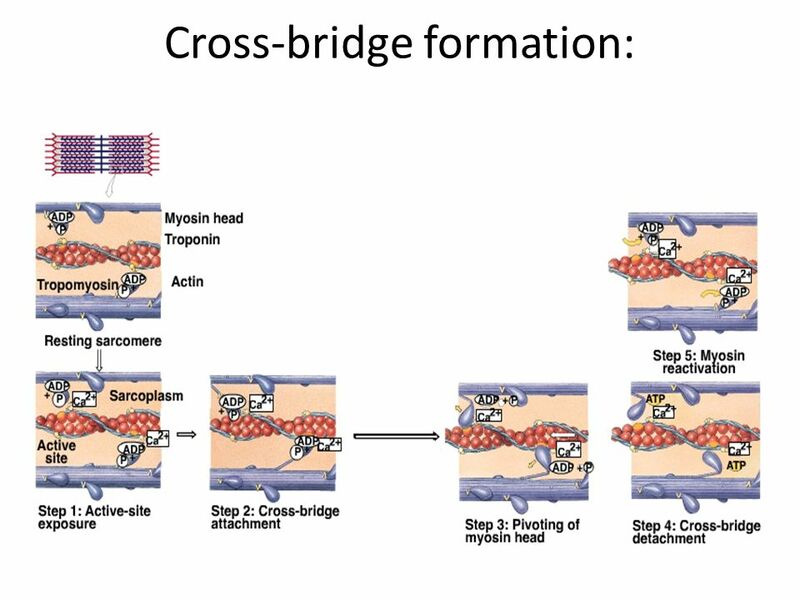 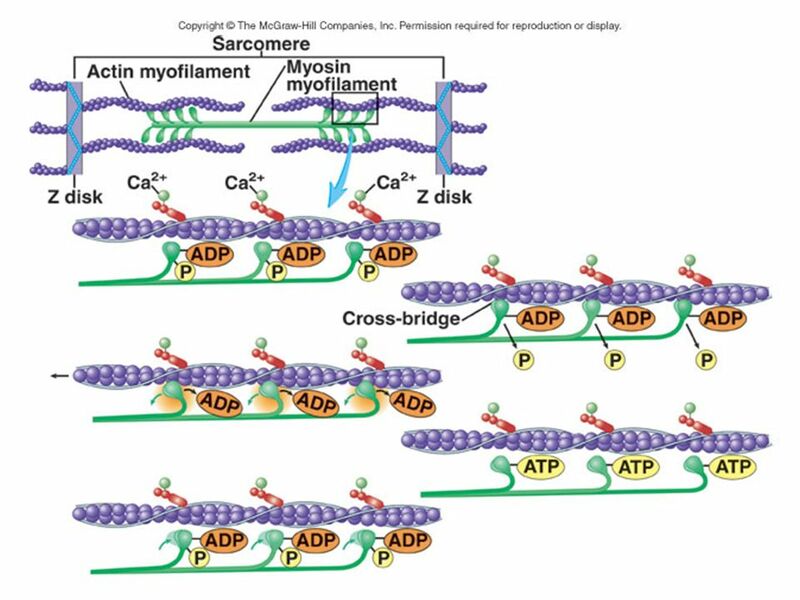 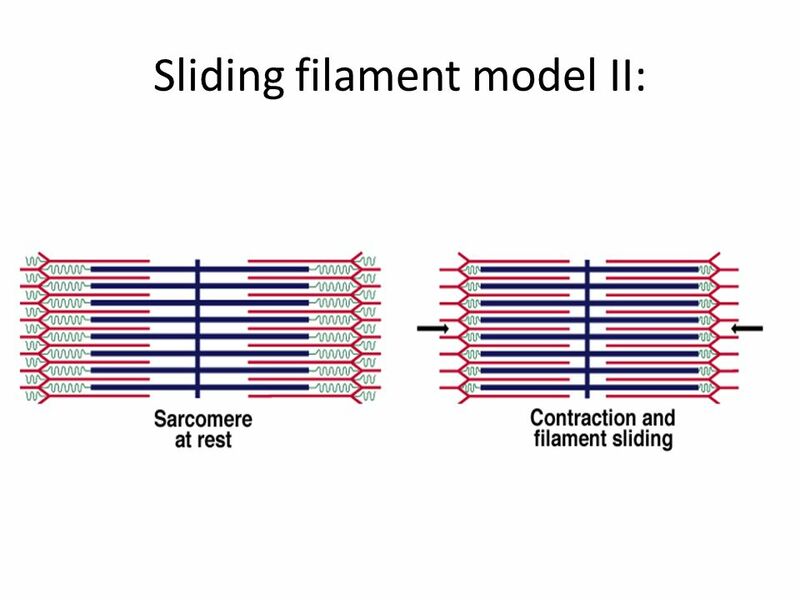 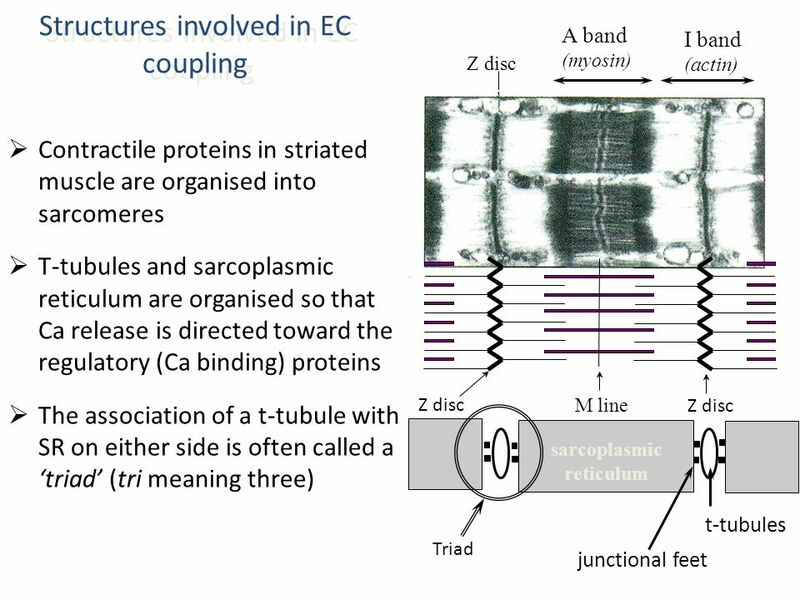 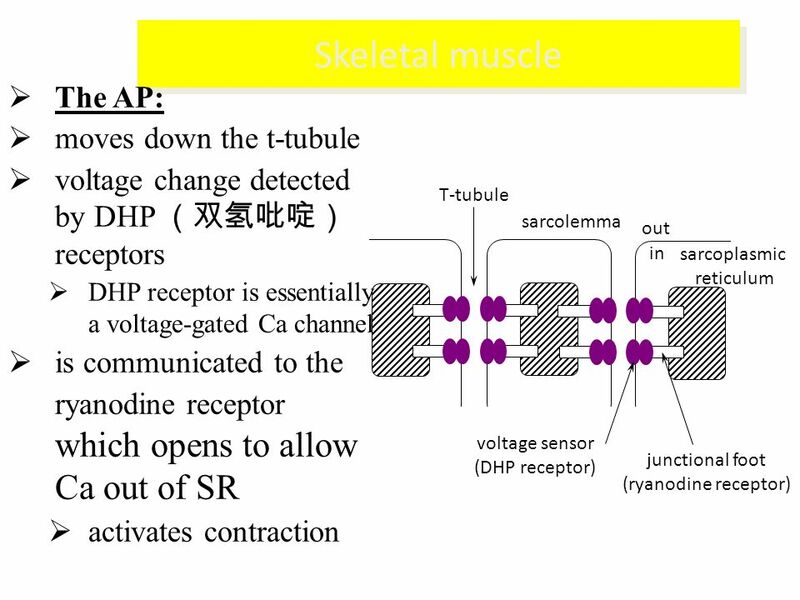 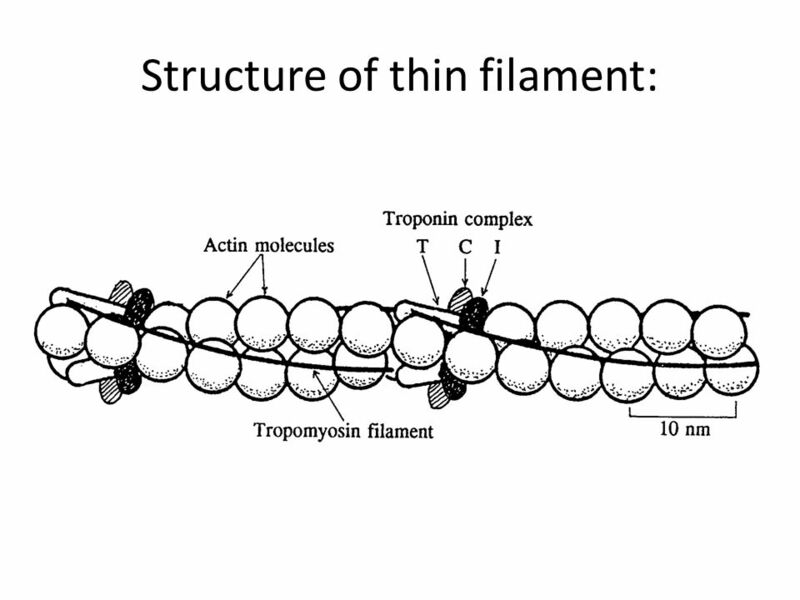 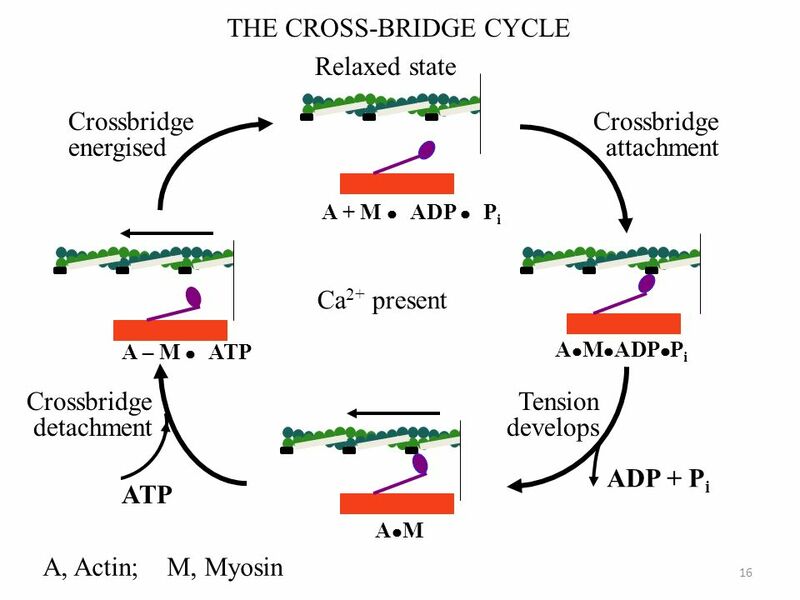 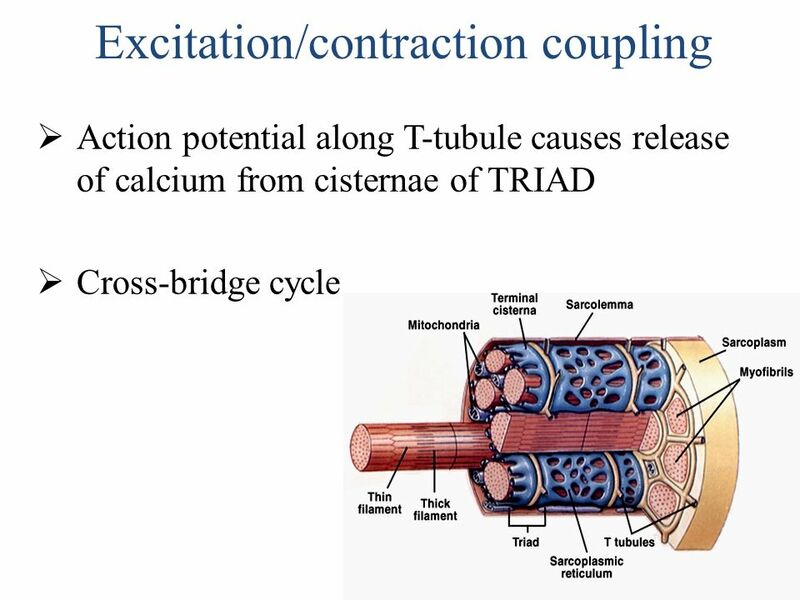 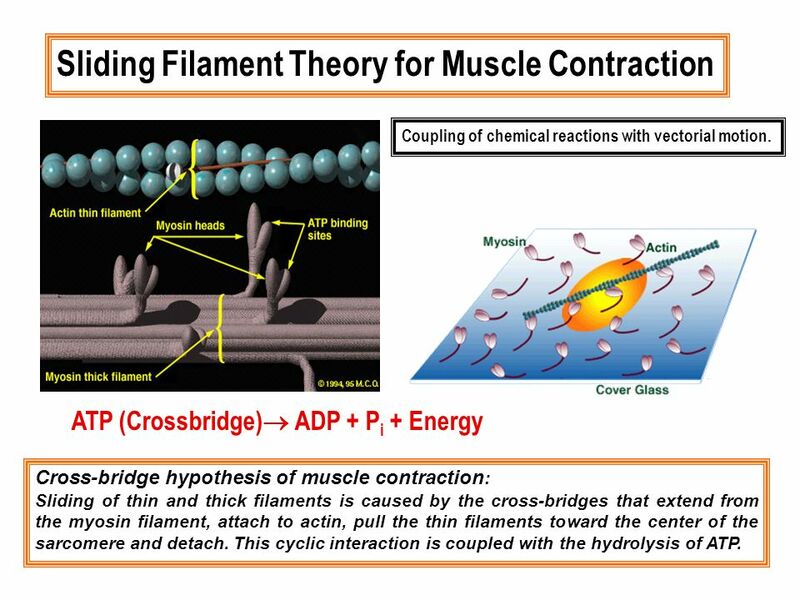 ATP (Crossbridge) ADP + Pi + Energy Cross-bridge hypothesis of muscle contraction: Sliding of thin and thick filaments is caused by the cross-bridges that extend from the myosin filament, attach to actin, pull the thin filaments toward the center of the sarcomere and detach. 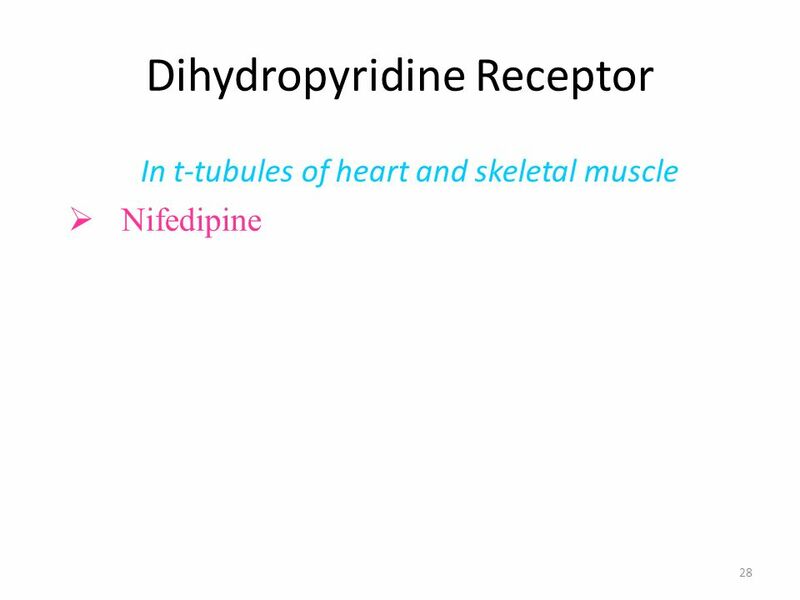 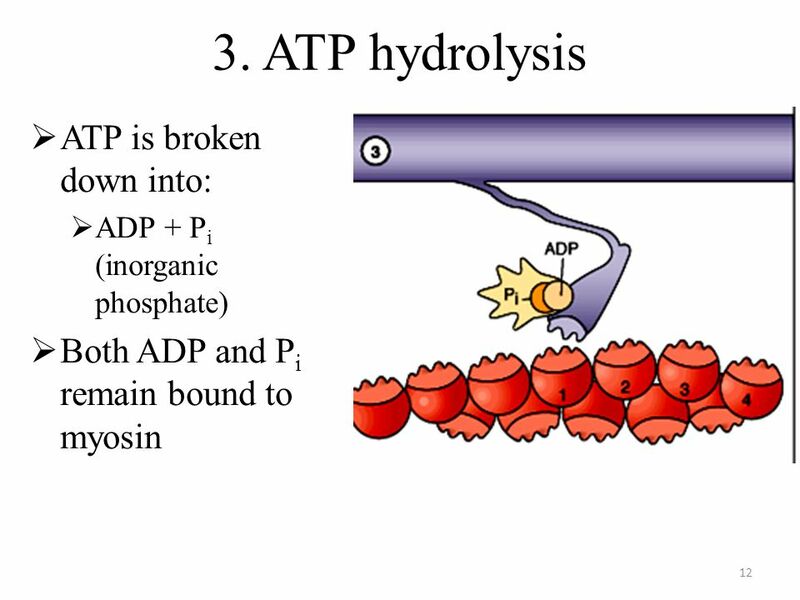 This cyclic interaction is coupled with the hydrolysis of ATP. 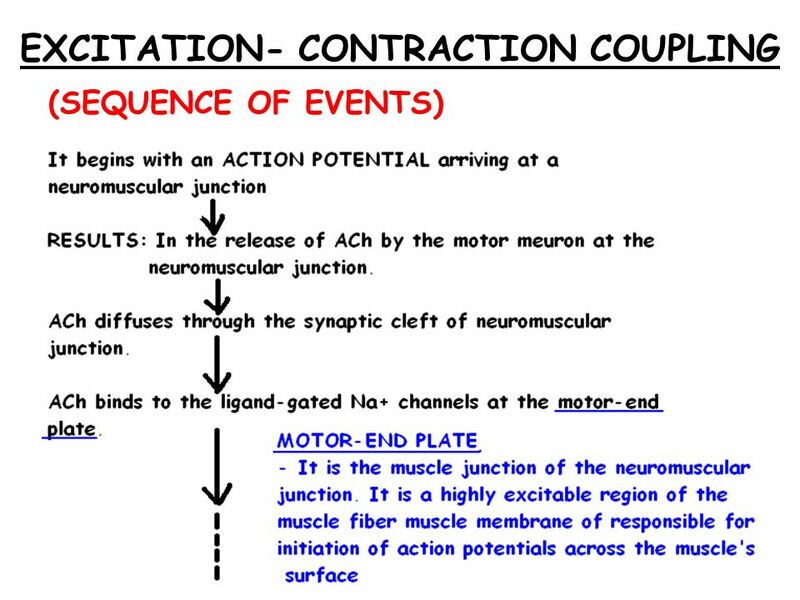 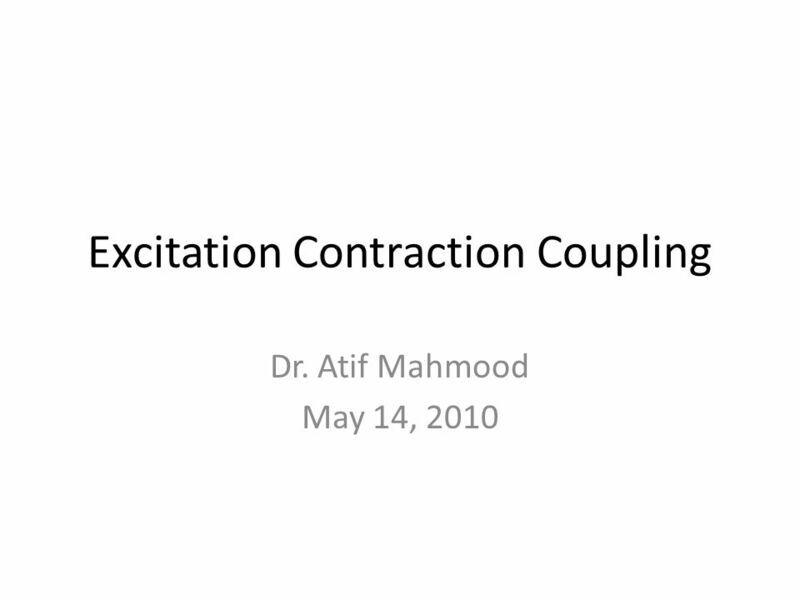 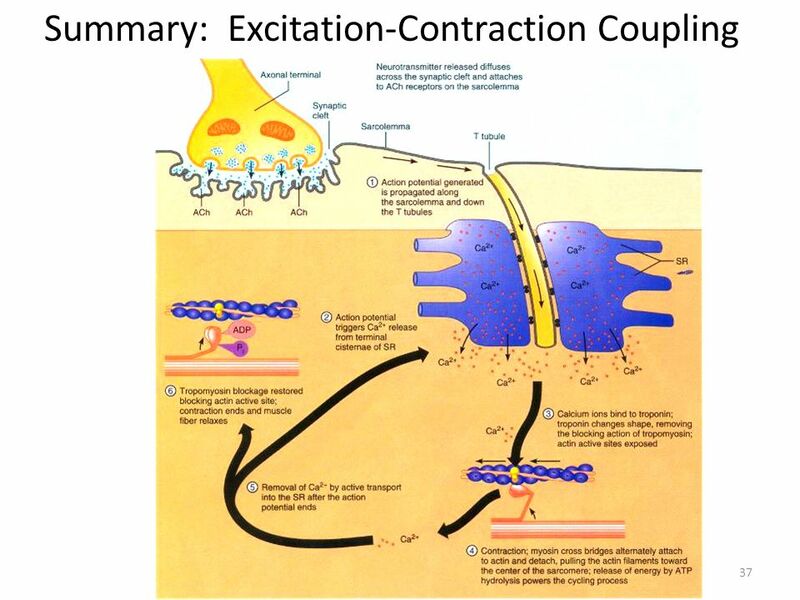 Download ppt "Excitation Contraction Coupling"
Depolarization Initially, this is a local electrical event called end plate potential Later, it ignites an action potential that spreads in all directions. 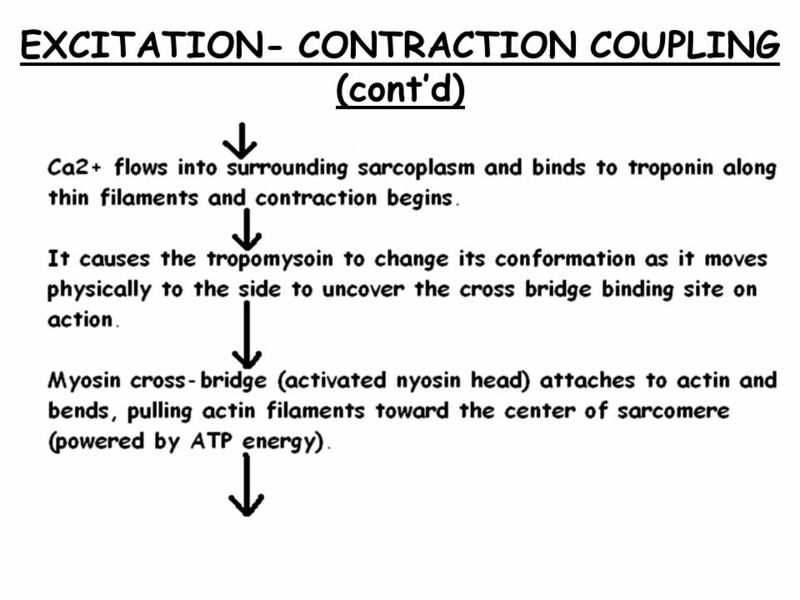 Copyright © 2006 Lippincott Williams & Wilkins. 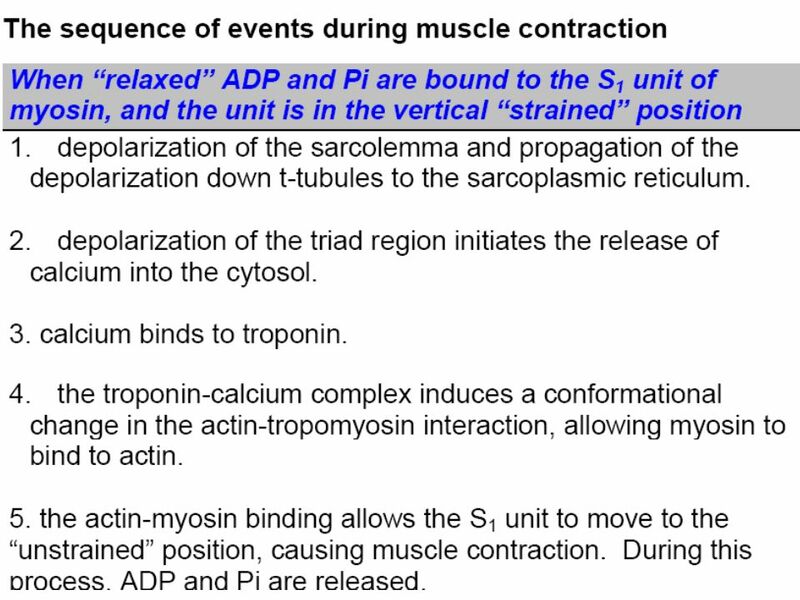 Muscular System Chapter 11 Part 2. 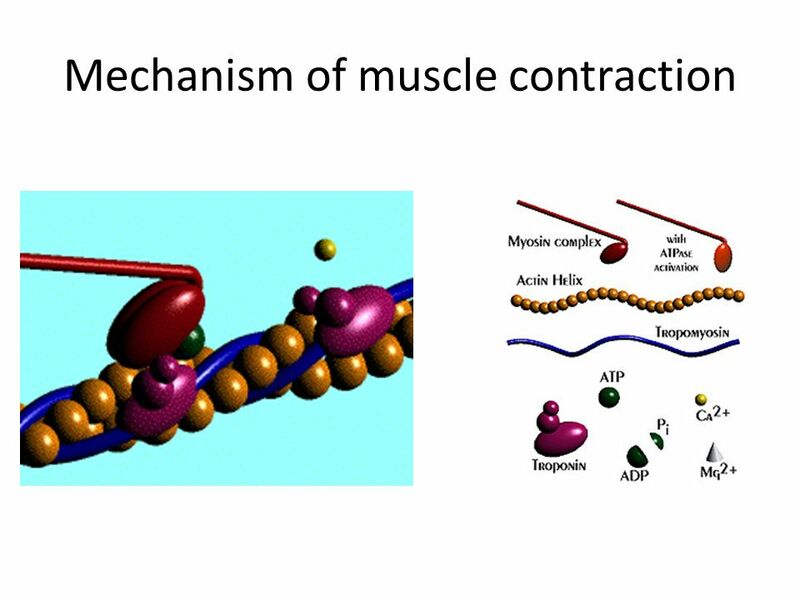 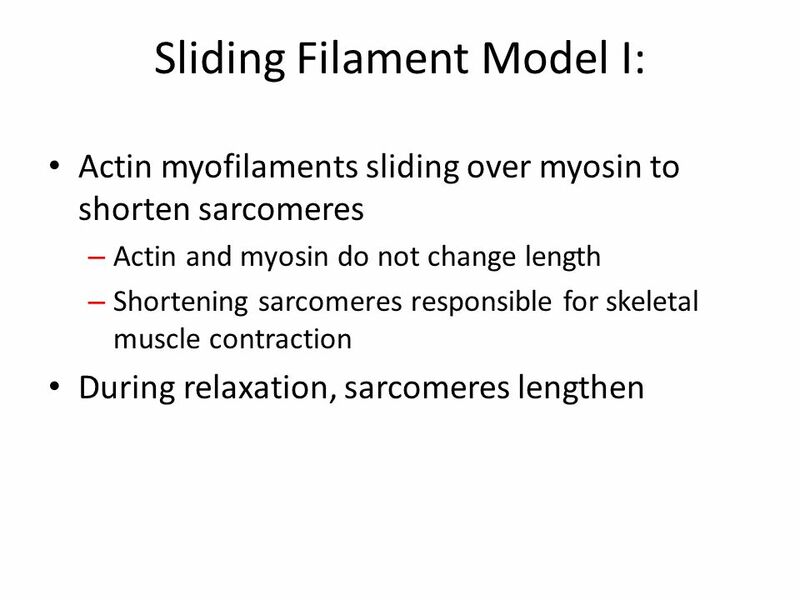 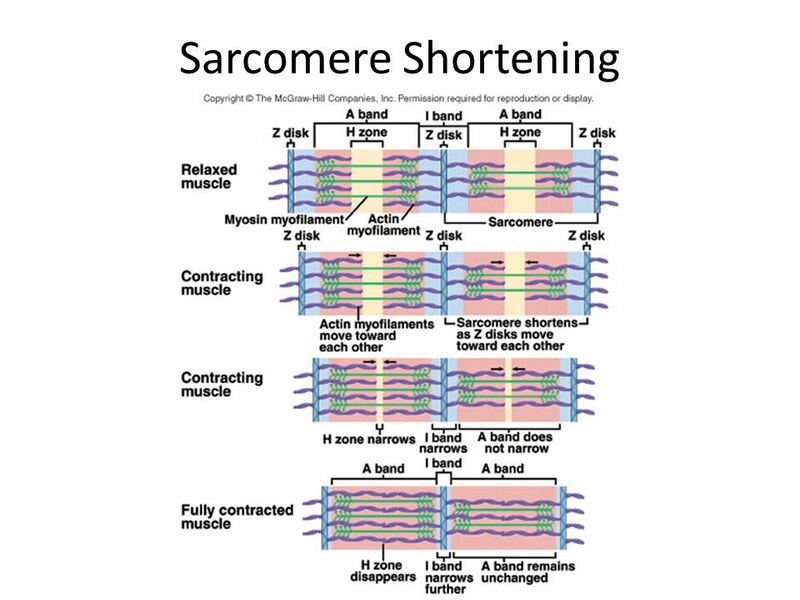 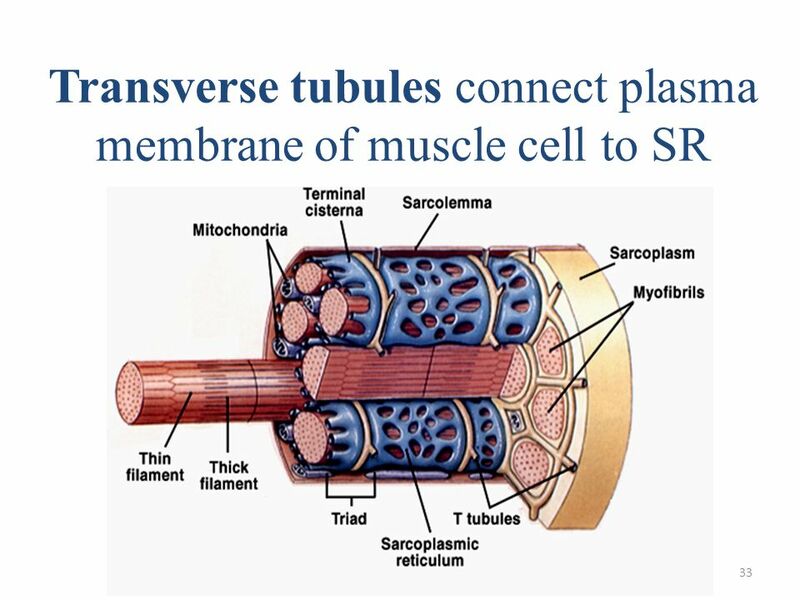 Muscles n Skeletal muscle organization and how it contracts. 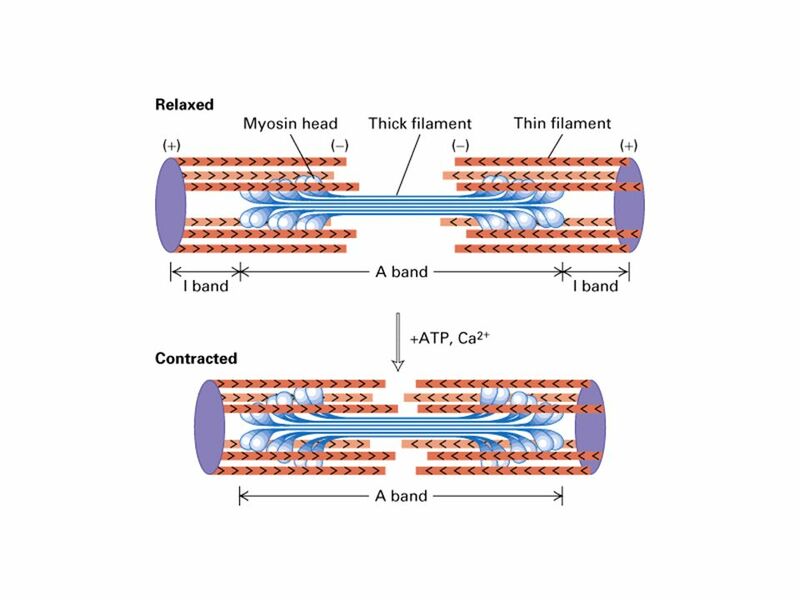 Muscular system SKELETAL MUSCLE Skeletal muscle is made up of hundreds of muscle fibers –Fibers consists of threadlike myofibrils –Myofibrils composed. 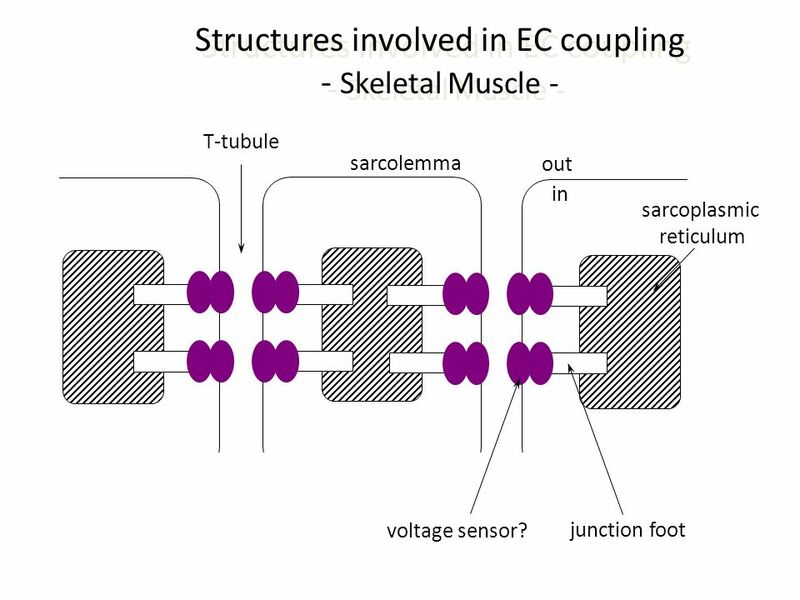 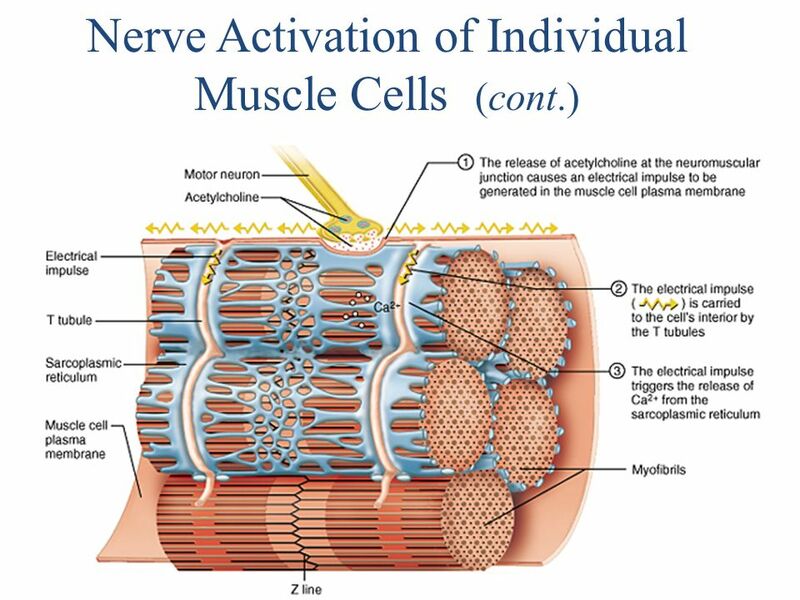 1 Structure of Skeletal Muscle We will begin our look at the structure of muscle starting with the largest structures and working our way down to the smallest.